May your weekend be full of hope. May you be able to move beyond your fear and insecurity into the life of someone else, releasing the right to control the outcomes of your movement. And may you remember the words of Wess Stafford, words that brought tears to my eyes every time I heard him speak them this week: If God makes you strong, it is so you can help those who are weak. 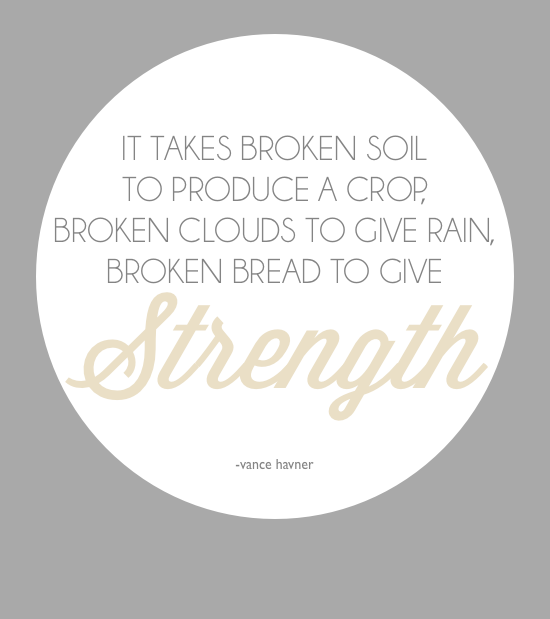 May you embrace your own strength and offer help to those who need it. And may you accept your weakness when others help you, being wise enough to receive it. 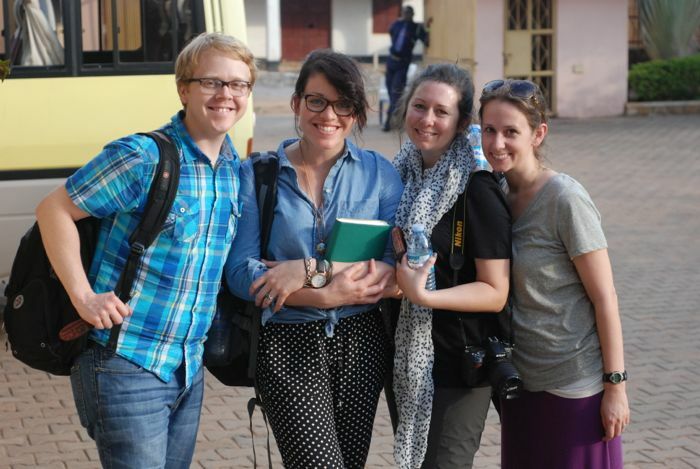 After a full week in Uganda, it’s time for us to head back home. We were supposed to fly out last night but we had a minor glitch in the form of missing our flight. 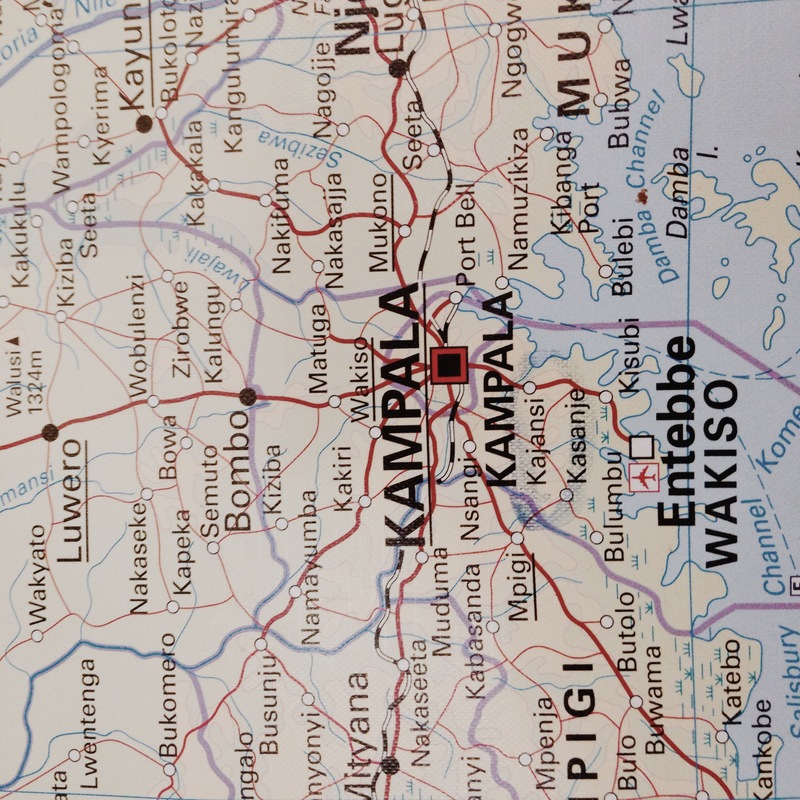 We’ll head back to the airport shortly, but on our way out I wanted to thank you for following our trip, for offering your prayers, and for sponsoring the children of Uganda. It has been an honor to travel with some of my favorite writers this weekend. If you haven’t had a chance to read all of their posts, I chose one from each of them to highlight here for you. Enjoy your weekend, friends. 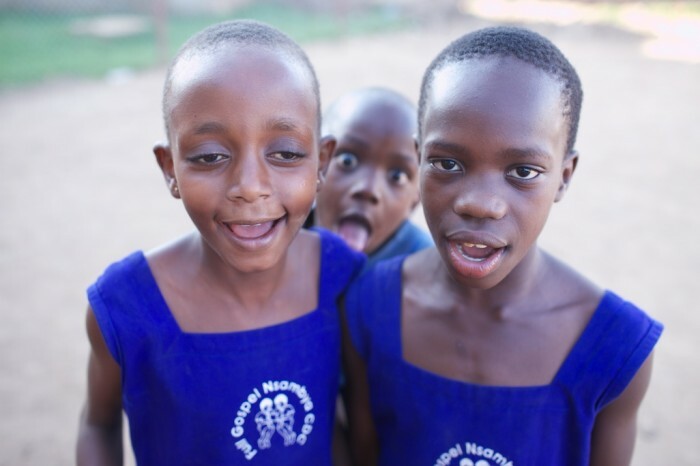 Are you ready to sponsor a child today? Here’s where you can release a child from poverty in Jesus’ name. At the end of every month, I like to share a few things I learned in the last 30-ish days. 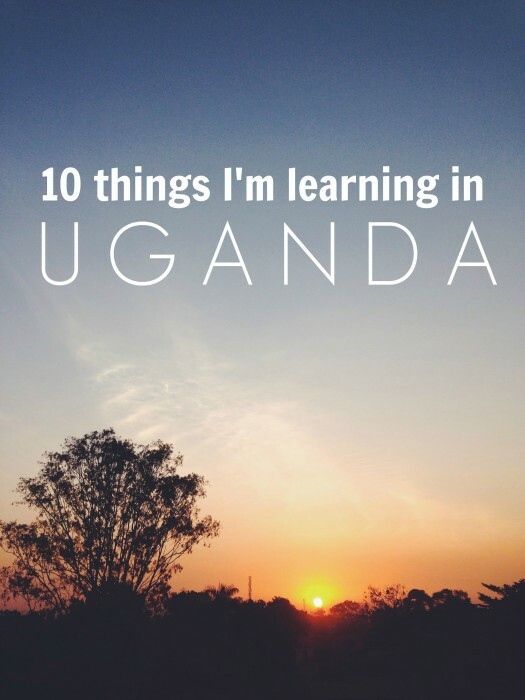 Since we’re in Uganda right now and I pretty much can’t think about anything but this country and her children and very small planes, it only seemed appropriate to dedicate this edition of Things I Learned to Uganda. 1. If you go to Africa in January, it will snow back home. Especially if it hasn’t legitimately snowed AT ALL so far this winter. 3. If you are in Uganda, place your iPhone in your lap. Turn the camera like you’re gonna take a selfie. But instead of taking a selfie, take a them-y. And don’t stop clicking. You will not be able to imagine where they learned this from. 4. Mike Varel is a fantastic, soulful, talented photographer. But even he can’t prevent the photobombs. And you will walk and half-skip with them through the slums they call home even though you know really horrible things happen here. But for a few moments you won’t be thinking of those horrible things and they won’t be, either. Because it’s time to have a parade. And when you talk about it later that night with the friends who were there with you, the one named Jeff Goins will say, “This must be what heaven is like – music, dancing, and children.” You will nod your head and agree with him. Because he has to be right. 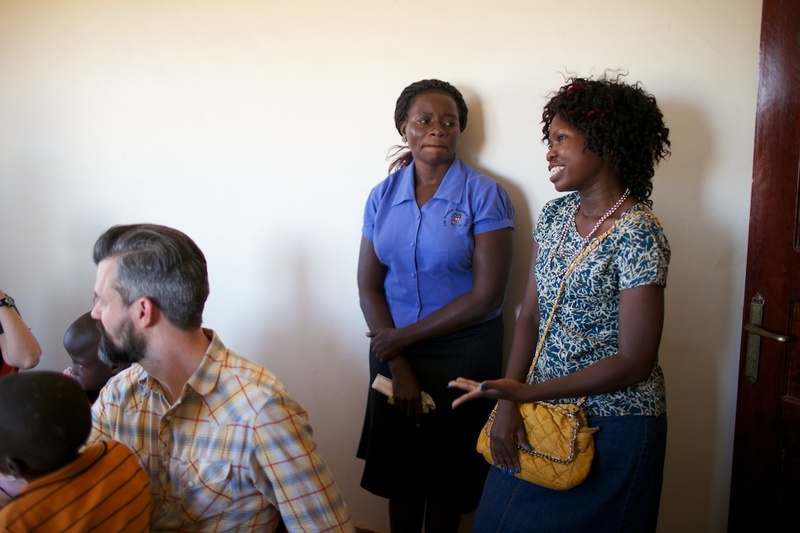 This young woman on the right graduated from the Child Sponsorship Program and is now in her last semester of university studying criminal justice. 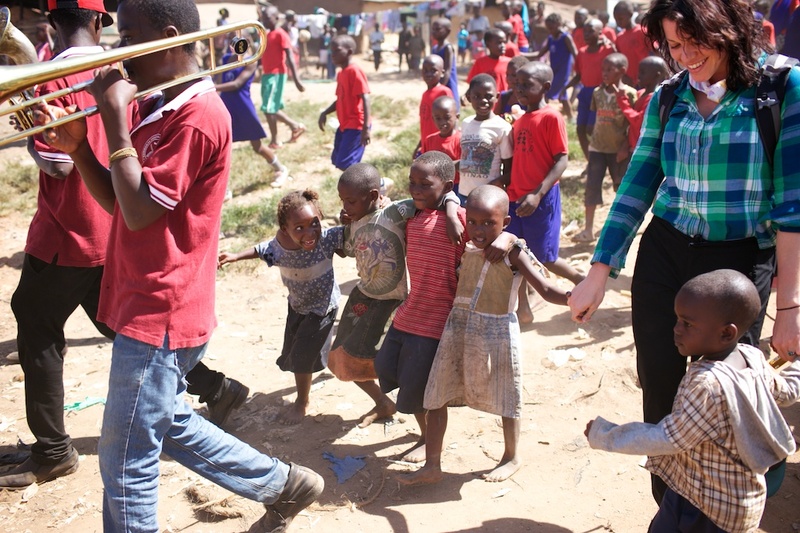 She visits this center and teaches the children their songs. 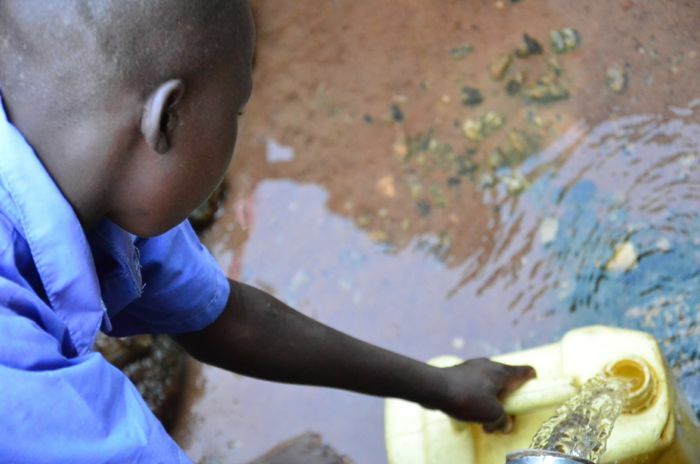 When she graduates from school, she wants to help make a change. These are the stories we want to hear. 7. 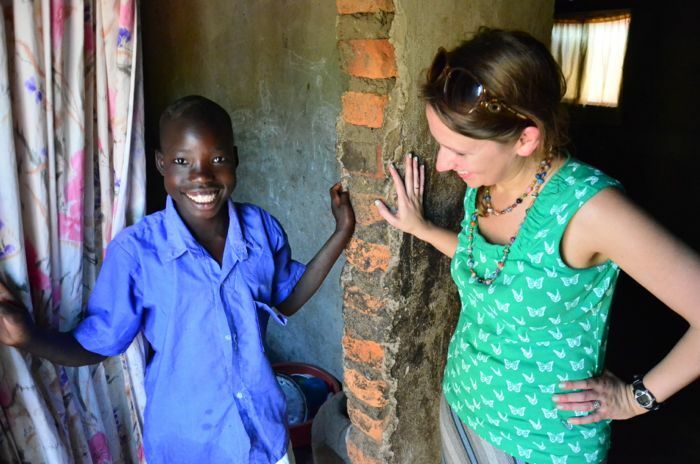 Child sponsorship doesn’t always work. But sometimes the parents can’t be convinced because poverty has already taken from them what poverty wants, including hope for the future. On the one hand, it feels like a risky investment. On the other, it feels like the Gospel. 8. When the parents are convinced, you will know it. 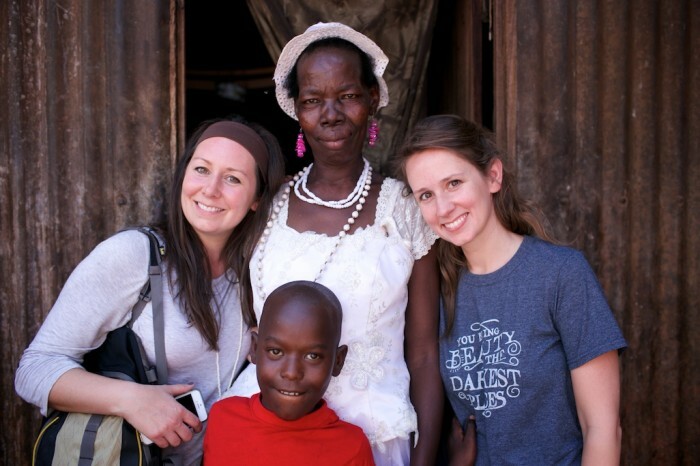 If you visit the home of a child who is sponsored through Compassion, the mother will be very grateful to see you. 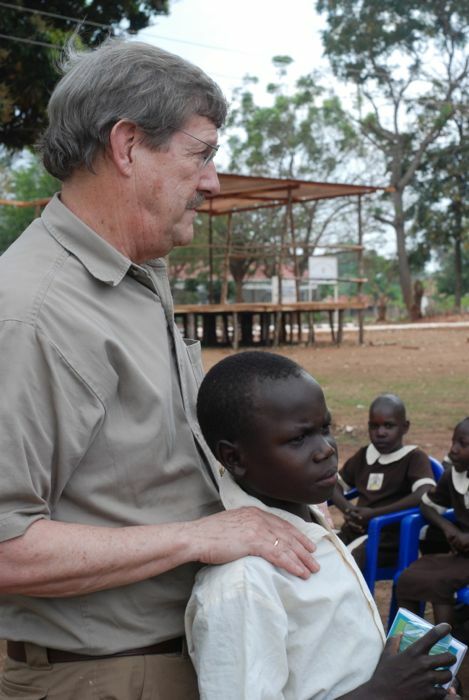 Especially if you come along with the President Emeritus of Compassion International, Papa Wess. And the way she will show her gratitude is by jumping up and down when you hug her, inviting you to enter into her home (however small it may be) and offering you gifts of honor and gratitude. The gifts will be chicken. In its various forms. 9. 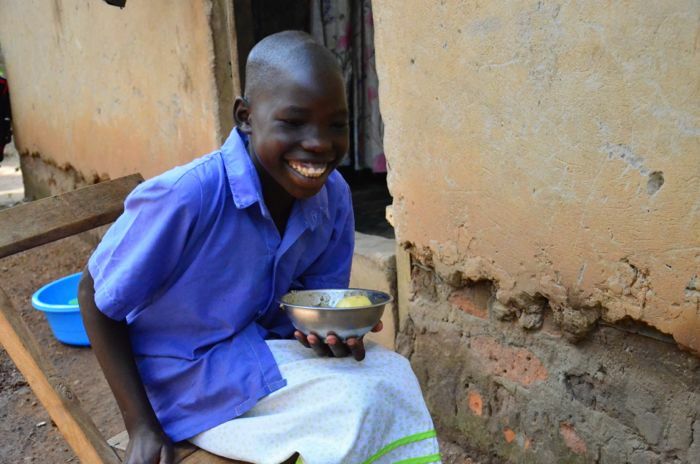 If you sponsor a child in Uganda, you will not regret it. 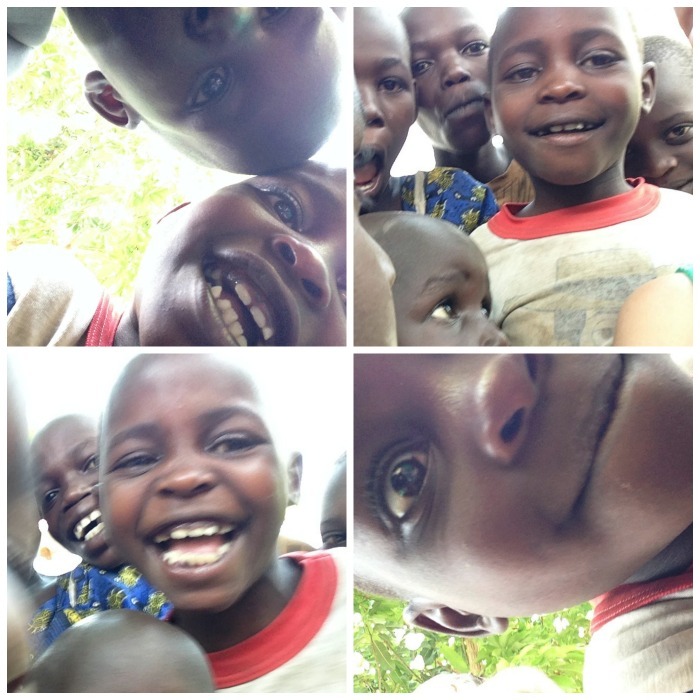 You will go look at the photos of children waiting for sponsors, then you will pick one of them. Do not, I repeat, do not over-think this step. If you need a guideline, just choose the one you are least drawn to. It worked for me. In a week or so you will get a packet in the mail telling you more about your child and you will write them a letter immediately, not because you have to but because you can! You can even do it online (it’s so easy – no stamps! No paper! This is worthy of lots of exclamations!) This first letter will be one of many you exchange with your child, because sponsorship with Compassion is not just about giving money, it’s about being a friend. 10. 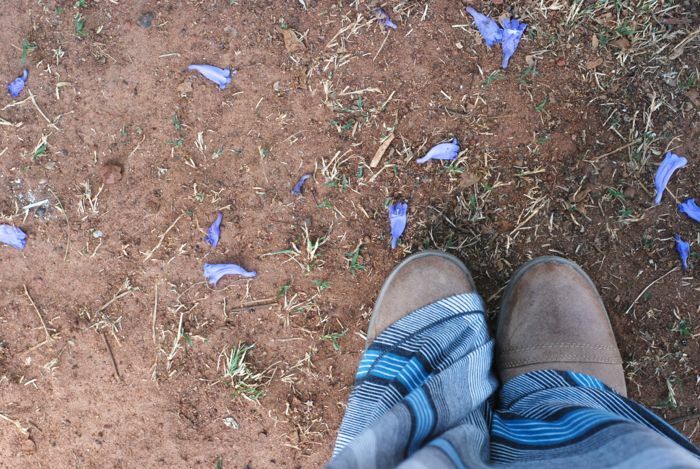 If you go to Africa in January and it snows back home, you won’t care a bit that you missed it. Especially if you sponsor a child who lives in Uganda. You know you want to. Here’s how. Count up to eight. Eight-thirty, nine-thirty, ten-thirty . . . three-thirty. It’s 3:30 pm in Kampala. Tomorrow, we begin the long trip, passing the sun as it sets in the west only to greet it again when it rises over Uganda. Here’s something dumb about me: I’ve never liked telling people how to pray or what to pray for. It makes me uncomfortable, probably for stupid reasons, one of them being I believe your conversation with God is personal and intimate and if he would have you pray for me, well then he’ll need to let you know. I don’t feel that way when others ask me to pray for them, but when people ask how they can pray for me, I get twisty. It’s not rational, I know. But here’s the thing: we would appreciate your prayers for this trip. To get us to Uganda, yes. But more, the reason I agreed to get on a plane across the world again was because I believe in the work Compassion is doing on behalf of children living in poverty and I want to help get kids sponsored. I will write what I see, but I am fully and completely and humbly aware of the simple fact that what I see may not be exactly what is. It will all be seen through the filter of my own culture, experience, and privilege, but I’m asking you to follow along with me anyway. 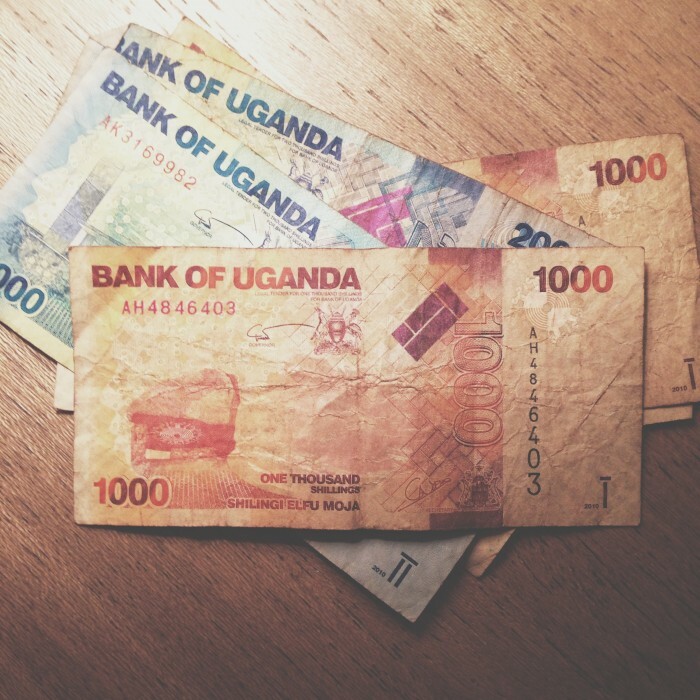 The truth is, we will be walking the carpeted floors of airplanes and airports nearly the same amount of time as we will be walking on the dusty clay of Uganda. Our time in the country is unfortunately short. But I ask you to follow along with us anyway. 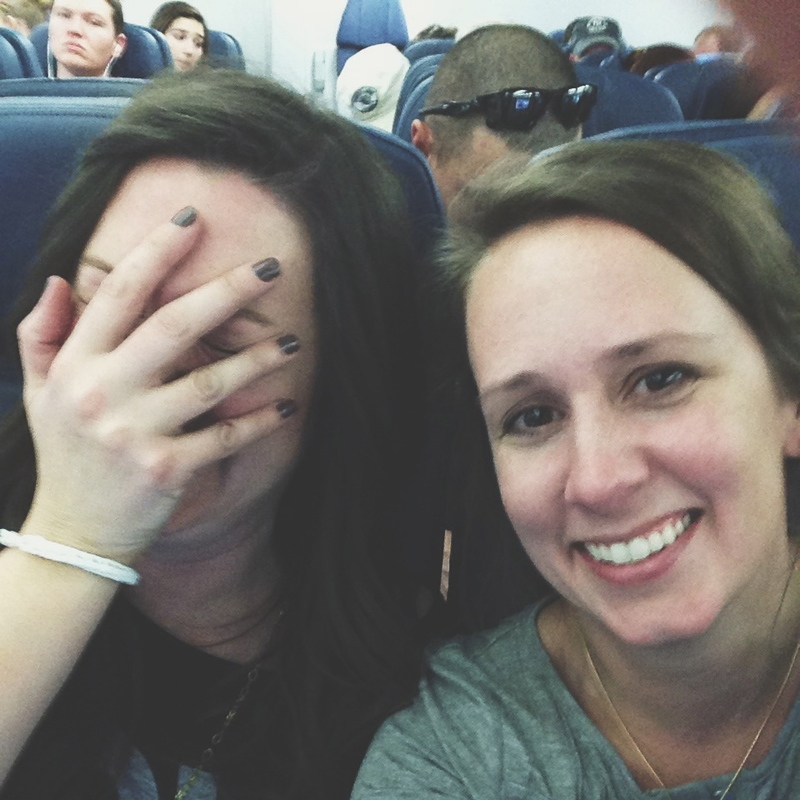 And on a ridiculous note, I will be traveling with my sister. That isn’t ridiculous by itself, it’s fantastic. But the ridiculous part is that when we are together, we get sisterly. Laughy. Jokey. Idiotic. Just ask Tsh. Or any person who has ever traveled with the pair of us. My kids tell me I have a laugh that only comes out around her. They always know when she’s the one on the other end of the phone based on my voice. For us, it’s a great gift to have each other. For others, I’m not sure gift is the word they would use. 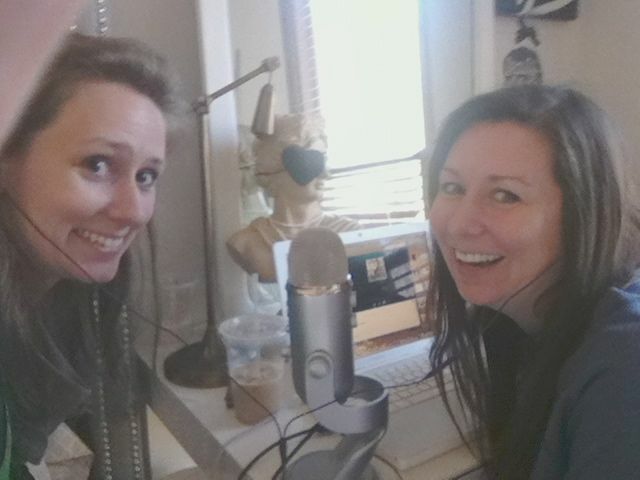 Here we are just before recording the Art of Simple Podcast with Tsh. We had to share a mic and earbuds for an hour. To say we were giggly is an understatement. I feel like I need to issue an official warning to our fellow travelers: I’m sorry. Laughter and snorting might manifest itself at awkward or inappropriate times, causing me to do something personally embarrassing or worse, culturally offensive (dear God, please no, anything but that). And I also ask for grace. Would you be willing to forgive us our inability to fully express and always accurately interpret what we see? Would you come along by reading with an open heart? Would you pray for us even though I’m not even sure how to ask that without feeling weird? 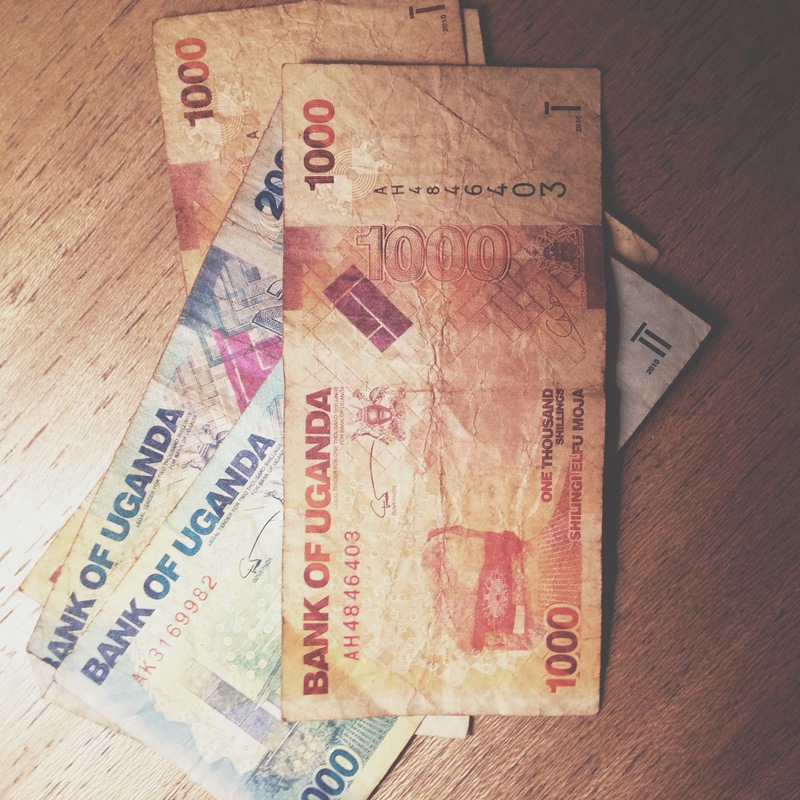 Most importantly, would you consider sponsoring a child in Uganda? You can click here to see some who are still waiting. Our posts begin on Monday. If we can get an internet connection. That could be another thing to pray for. You know, if you want. Whatever. I’m not the boss of you. 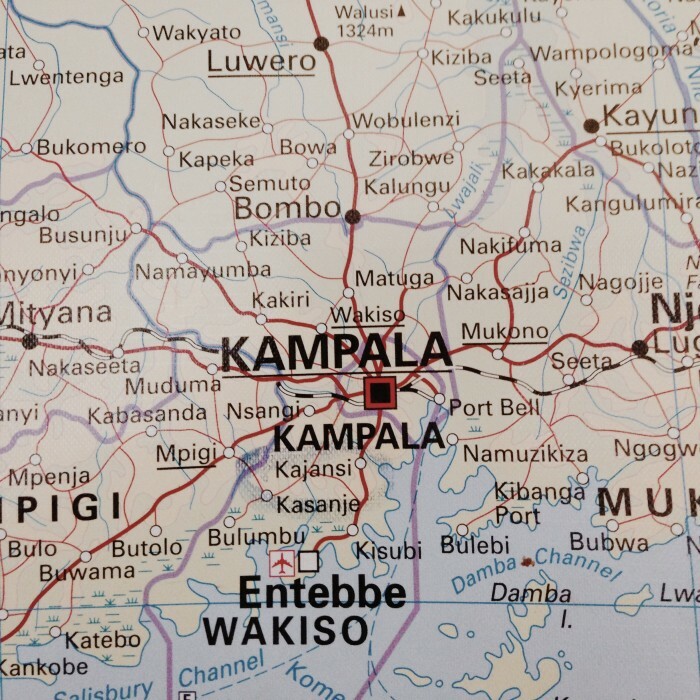 If you want to keep up with all of my posts while we’re in Uganda, simply continue reading the blog as you normally do. If you would like to read what everyone else is writing, too (yes! do!) simply visit this page where all the posts that Myquillyn, Jeff, Joy, Brianne, Shaun, Wess, and I write will be gathered in one spot for easy reading. On that same page you will also be able to watch to see how many children are sponsored daily – with a goal of 400. Here’s how it looks today. Thanks for your prayers, and for forgiving me my awkwardness in asking for them. I hope you’ll follow along. My sister Myquillyn and I shared a room until I was in fourth grade. We nailed stuffed animals to the wall next to the bed we shared and giggled when we were supposed to be sleeping until Mom would fuss at as from the living room to quiet down. We grew up with cats having kittens in the shed, a tire swing in the backyard, and grandparents living right around the corner. Mom brought out the white tablecloth for birthdays and our friends lived right next door. We basically played outside all summer until Mom called us in for dinner. But then, at the end of fourth grade, our family moved from that little white house on Gladstone Avenue in Indiana to a little yellow house on Greenway Drive in Iowa – six hours away. Leaving the place we had always known for a place we knew nothing about was scary in the fourth grade. But one thing made it less scary – knowing my sister would be there, too. Not a lot has changed in twenty-five years. When Shaun asked if we would be willing to travel again with Compassion, he sent one email, addressed to the pair of us because he is a smart man and knows two sisters are better than one. It took us a few weeks to decide for sure, not because we doubt Compassion, but because we doubt air travel and things of that nature. In the end (or the beginning depending on how you want to look at it) saying yes was a lot easier knowing she would be there with me. When you are uncertain, it helps to have someone remind you what is true – someone who knows you well, who sees you, and keeps track of you – not just your body but your soul. My sister does this for me in life and she does it for me on this trip. And today I realized it’s the same thing Compassion does for children. Today Wess told us that Compassion commits that every child will be three things: known, loved, and protected. Sounds a lot like having a sister. 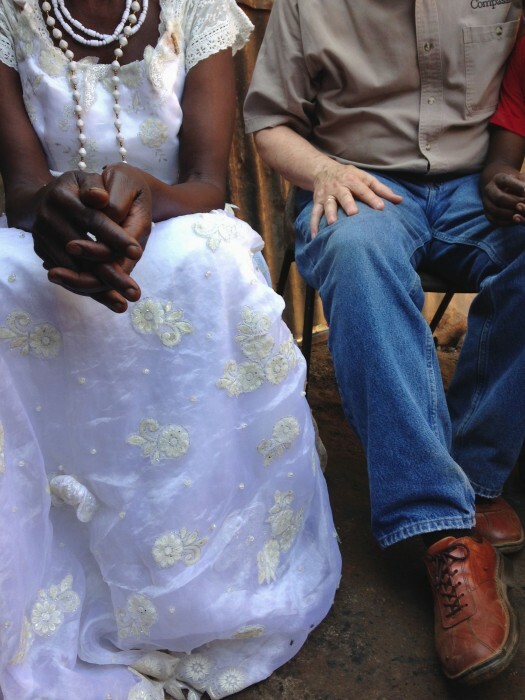 I was feeling weary this morning when we arrived in Katwe, a slum neighborhood here in Kampala. 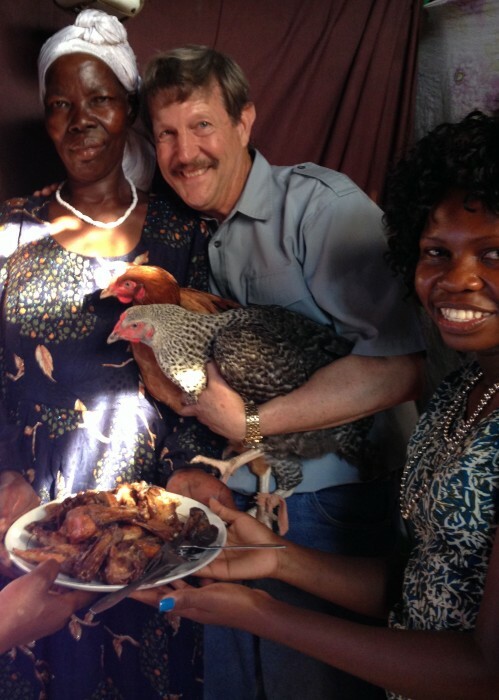 Myquillyn, Wess, and I were heading back to the home we visited yesterday, the one where the joyful mother gave us chickens. As we made our way up the hill where Joseph and his mother Rose lived, I remembered the words from the t-shirt I had on, a phrase from a song called Bloom: You bring beauty to the darkest places. I wanted it to be true today. Yesterday when we first met her, Rose was embarrassed that she wasn’t dressed more for the occasion of our visit. She kept putting her hands on her head, smoothing out her skirt, motioning behind her to the one room she shares with her son Joseph as if she wanted to change her clothes. We weren’t able to stay long then, assuring her she need not change and we would be back tomorrow. And there it was, the beauty in today’s dark place. 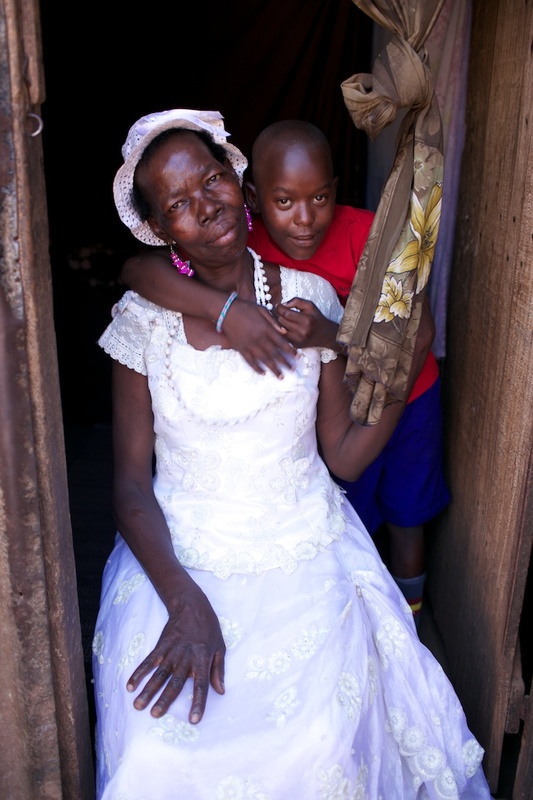 We sat down with Rose and heard her story through a translator, learning she has a life-threatening illness and has worked hard to secure Joseph’s future. Rose knows, loves, and wants to protect her son. I can’t think of a better partner for her than Compassion, an organization who makes it their goal to ensure every child is known, loved, and protected. But here’s the twist: though she is sick, Rose is not despondent. She is determined, faithful, and prepared. She trusts God, has a heart of deep gratitude, and a dignity that I don’t understand but fully experienced in her presence. Her hope was timid, but it was there. 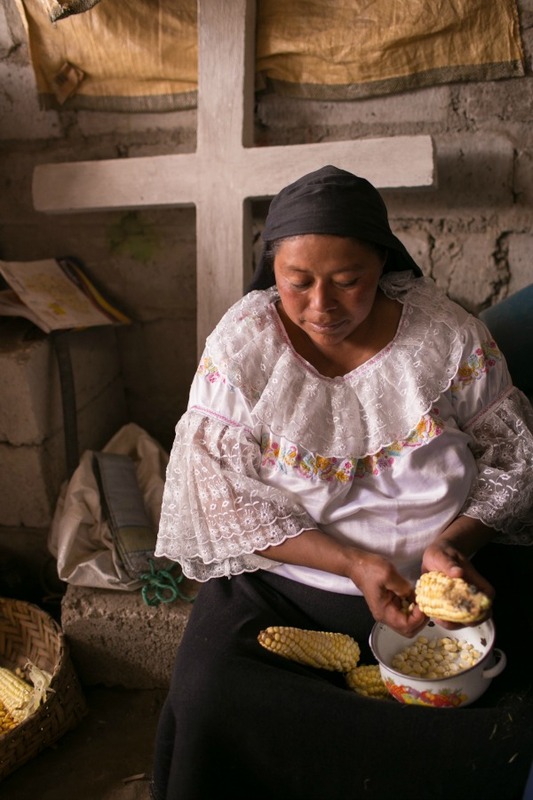 Because Joseph has a sponsor through Compassion, Rose doesn’t have to face her uncertainty alone. My sister does this for me. Compassion does this for Joseph and Rose. And you can do this for a child today. Beauty already exists in the darkness. Do you want to be part of it? Here’s some beauties to choose from. Since Myquillyn and I visited the same home today, she’s sharing Rose and Joseph in her own Nester way. 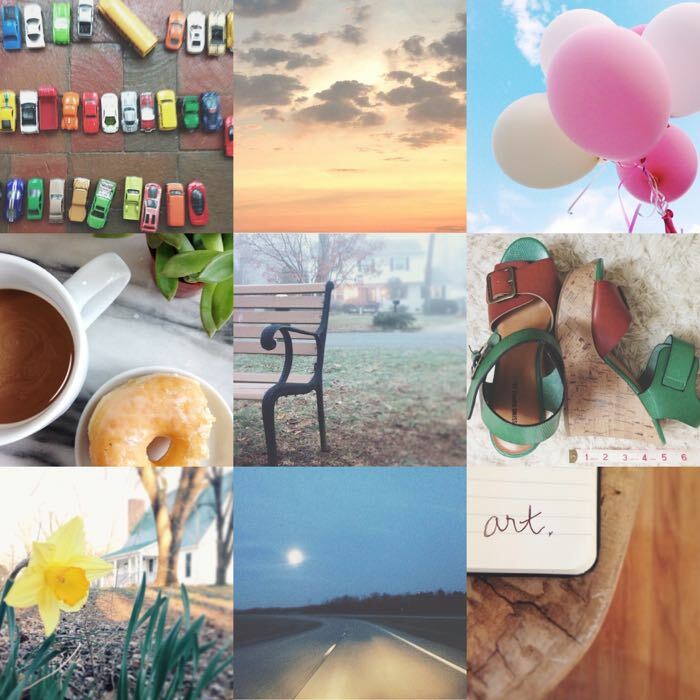 Visit Nesting Place to read and see more about sisters, family, and what makes a home. 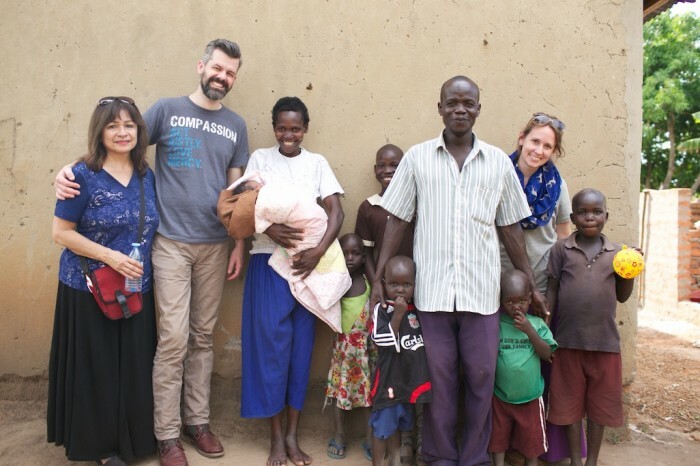 And you can read all the posts from Uganda on the Compassion Blogger page. Larry Crabb tells the story of how his wife was abused as a little girl but he didn’t know it until many years after they had been married. When she finally felt safe enough to share the truth with Larry, she cried as she spoke because it was so painful. But Rachael told Larry another story of when she was a young girl, about an adult in her life who truly loved and cared for her. He treated her with kindness, with respect, with compassion. When she shared this story for the first time, she wept. She sobbed, shoulders heaving, unable to control the overwhelming memory of being seen and loved as she was. Perhaps love touches our souls more deeply than pain. I tell people all the time to pay attention to what makes them cry. Not because it unlocks some kind of deep secret meaning of life, but because it simply helps connect us to the deep, secret parts of ourselves. When something moves you enough to bring tears, lean in and listen up. Yesterday after I met our family’s newly sponsored child, Otwii Paul, our team split up into three groups to visit homes of the children enrolled in the child sponsorship program with Compassion. Shaun and I went to visit the home of eleven year old Colline. 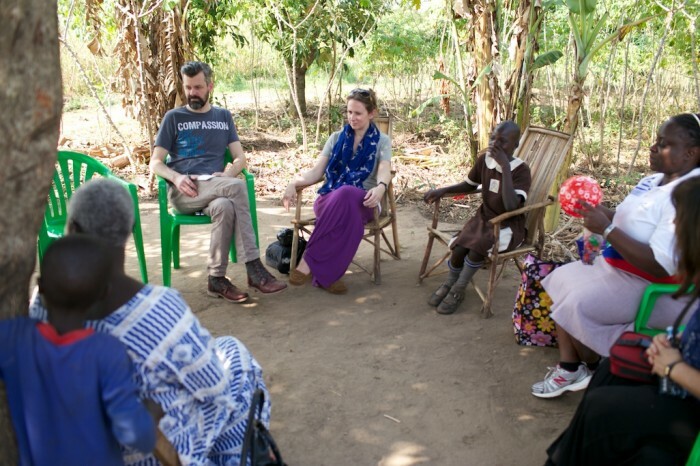 We sat in a half-circle under what I’m pretty sure were banana trees, chairs lined up neatly on the cleanest dirt I’ve ever seen in real life, and listened to this family’s story. Colline’s uncle Richard was gracious enough to sit with us yesterday and share their story of escaping the rebels who captured and killed his brothers, including Colline’s father. He was willing to tell us about how they hid in the bush to stay alive, how they would push the children under the grass so they couldn’t be seen, and how the children knew not to make any noise. Besides, they were too hungry to make much noise anyway, so they spent the days sleeping, hiding in the bush. He told us the story of how he and his wife decided to take Colline into their care even though they already had four children of their own. It was a hard story and they were gracious to tell it. But I didn’t cry while I listened to it. 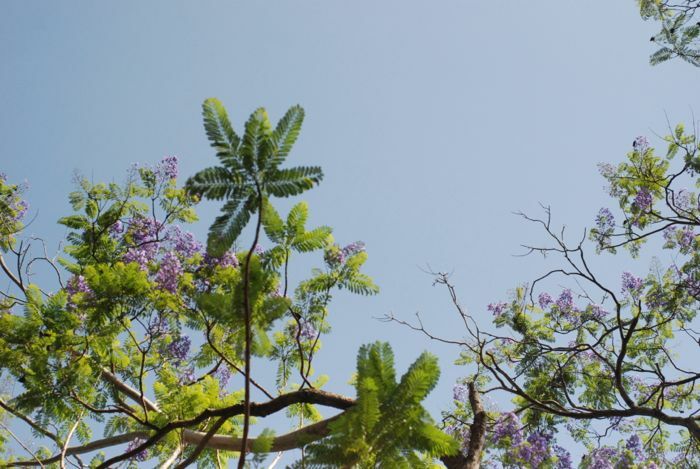 It was almost too sad to comprehend, too distant to connect with, too hard to imagine this family hiding to save their lives while we sat safely under the banana tree beside the house Richard built with his own hands. 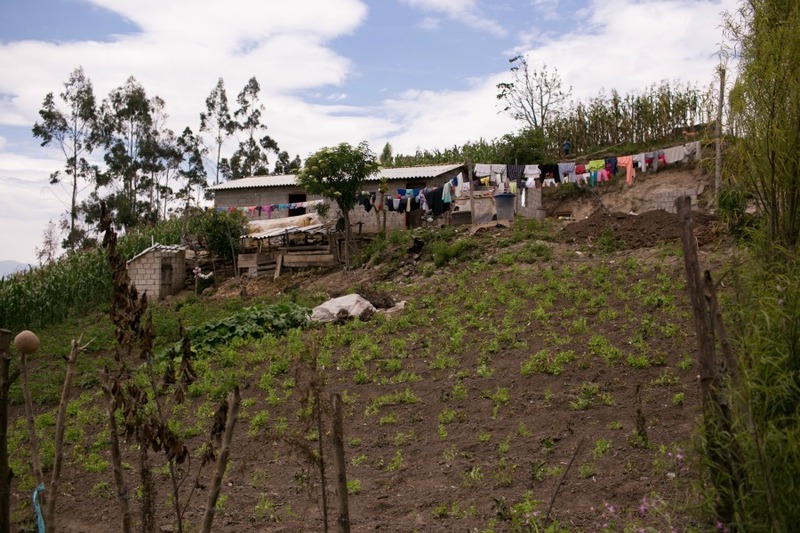 Today, we went back to their house curious now to simply see what Colline’s daily life looked like and how Compassion helps to make it better. This, evidently, is hilarious. Because when the translator told Richard what we wanted to do, he broke out laughing. I guess when you don’t watch reality TV or instagram your pretty lunch plate or know about taking selfies and whatnot, it’s a hard concept to grasp. He was gracious to share the devastating story. But he didn’t see the point of telling the daily one. Shaun tried to explain a little more. The small stuff. The little things. The everyday rhythms. Finally, someone convinced this family we were genuinely interested in understanding a bit more about their daily life, they began to catch on. Maybe too much, actually. 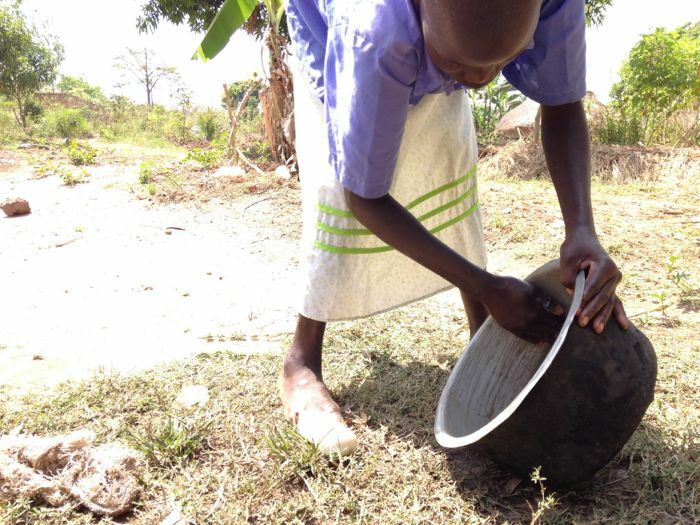 Because Colline began doing the chores she normally does early in the morning, chores that had already been done by the time we arrived. Part of me wanted to stop her – no, just do what you do! It’s okay! Don’t wash clean dishes! Don’t pretend to peel potatoes! But it had gone too far by this point. So we followed as she walked us through her daily chores. She washed her siblings faces. 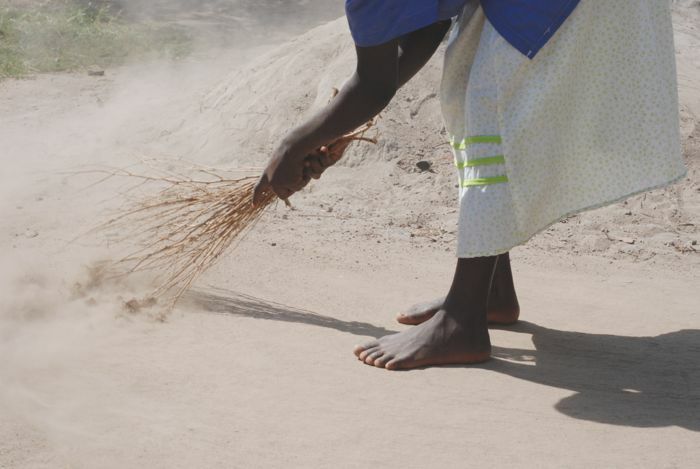 She swept the ground in front of their home with a broom she made herself. She took us to the place where she gets water. Then she disappeared for a while and when she came back, she had on her school clothes even though it wasn’t a school day. See, this is how I go to school. This is how I dress. These are my school shoes. She walked ten feet down the path and then turned around and came back again. And then? She changed back into her everyday clothes and made herself an after school snack. For after her pretend school day. And here she is praying before she eats it. She seemed to take pride in showing us her life in this small way. Instead of us just jumping in on a dish-washing or a laundry-hanging, we got a feel for the whole day in a matter of hours. It was a simple day, a happy day. It was a day spent with this family of seven and about twenty other children from the village who came to basically look at us because obviously. 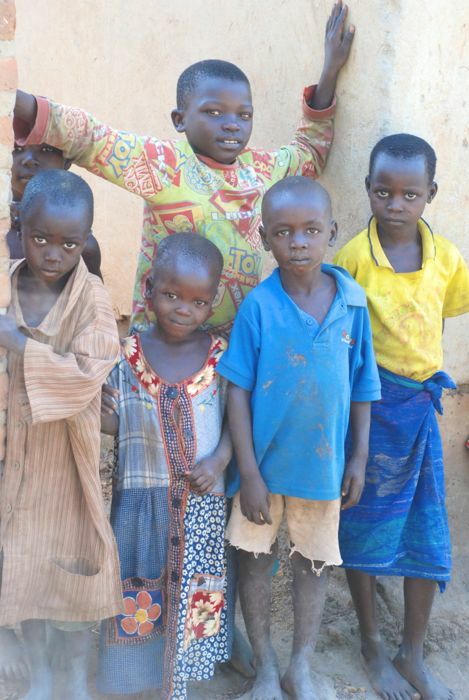 None of these children are part of the child sponsorship program – only Colline. If you lined them all up and included Colline in the mix of them, I’m pretty sure I could pick her out on the first guess. When Colline first began in the program in 2009, she didn’t interact well with others, had poor health, and nightmares at night. 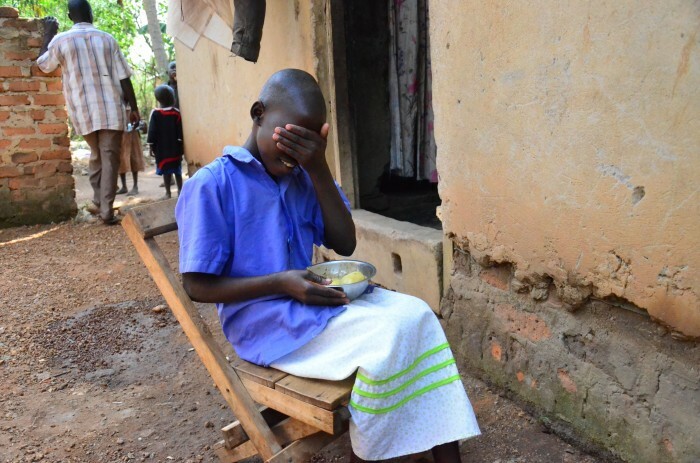 Because of the support of her sponsor, she gets a pill every six months that keeps her from getting lesions like the ones I saw on some of the other children. She has a project overseer who prays for her every Monday and Thursday to keep the nightmares away. 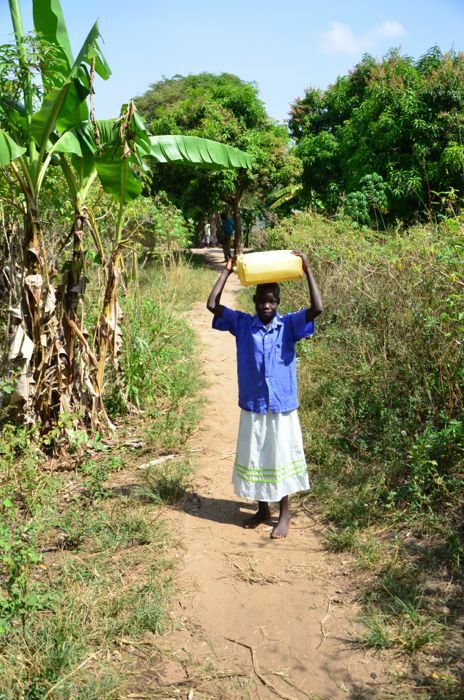 She has a mattress to sleep on, a kerosine lamp in her house, a barrel they use for storage in the kitchen. 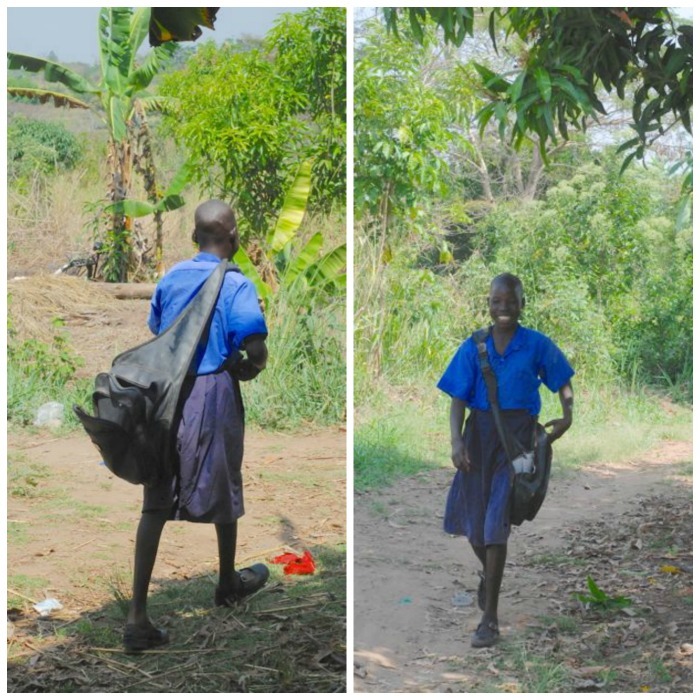 She is able to go to school (even though the public school tuition is one third of Richard’s salary) because Compassion pays her school fees. Colline also has a fun, safe place to learn about the Bible every Saturday at the church where the Compassion center is located, adults who know and care for her, and the dignity that grows naturally in a child who has hope for her future. She is clearly comfortable interacting with others. 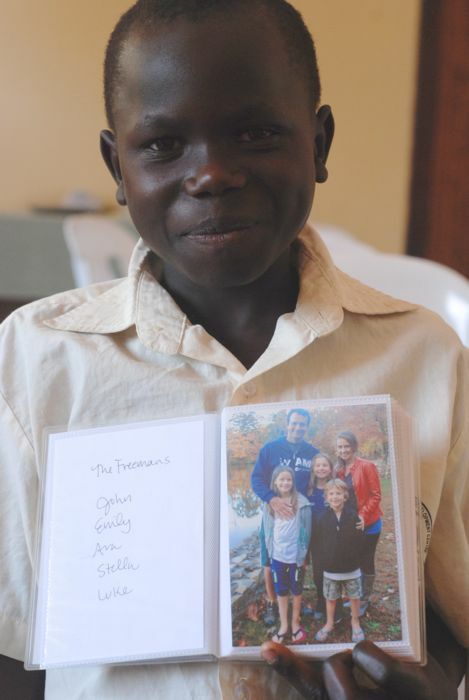 And even though Colline is the only child in the family registered, the whole family benefits from her sponsorship. Even though I heard Richard’s devastating story yesterday, I didn’t tear up when I heard his pain. I teared up when I saw his hope. It starts with a child. I know there were twenty other children in the yard today who don’t have sponsors and aren’t registered with Compassion. Richards own four children were among them. 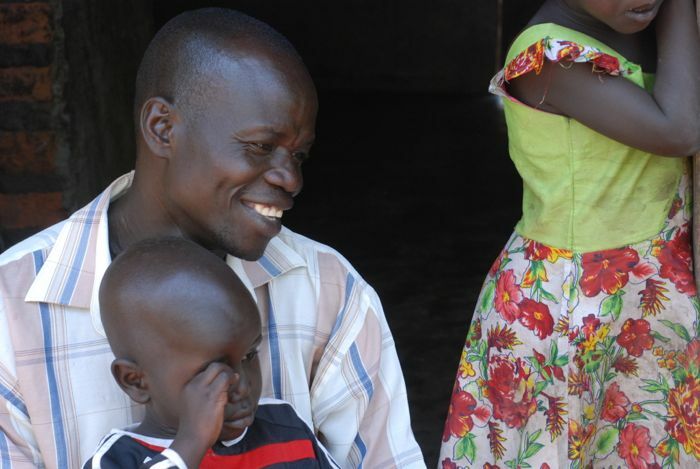 But having his niece sponsored benefits not only his family, but his whole neighborhood. 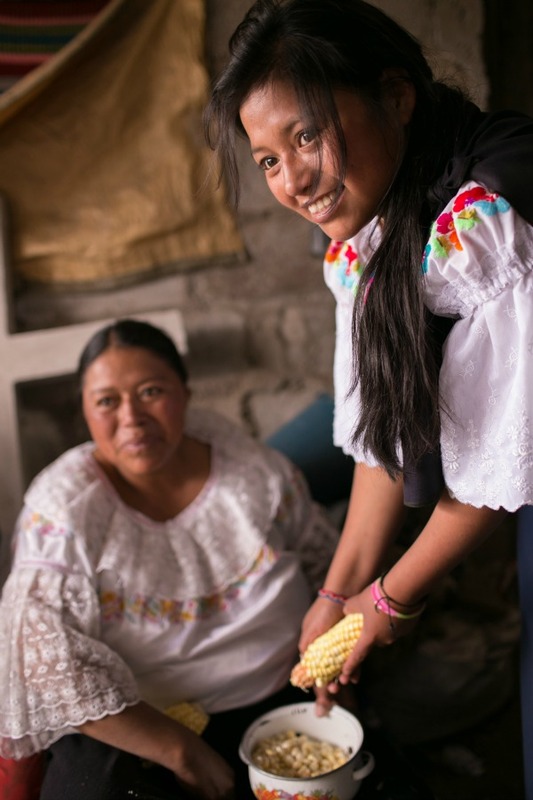 Colline is learning to be a leader right where she lives all because of a sponsor who decided to partner with Compassion for $38 a month to change her life for the better. 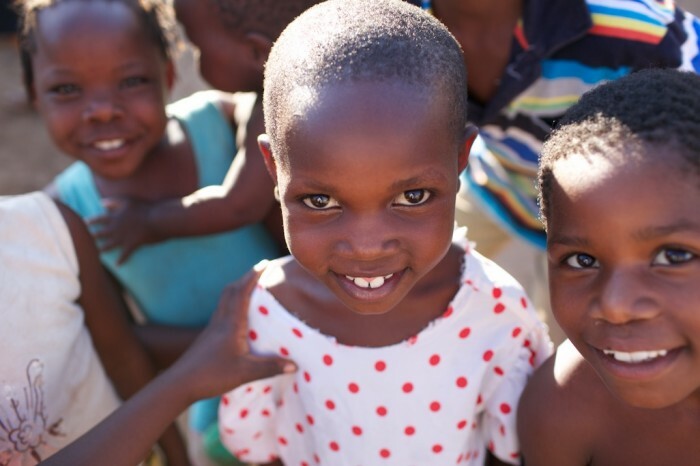 Would you be willing to join Compassion in rescuing children from poverty in Jesus’ name? 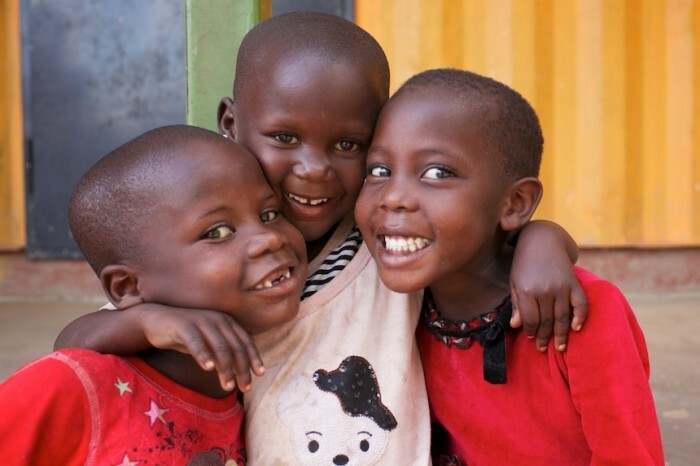 Would you pick a child to sponsor today? Thank you for reading these posts. Thank you for sponsoring kids. 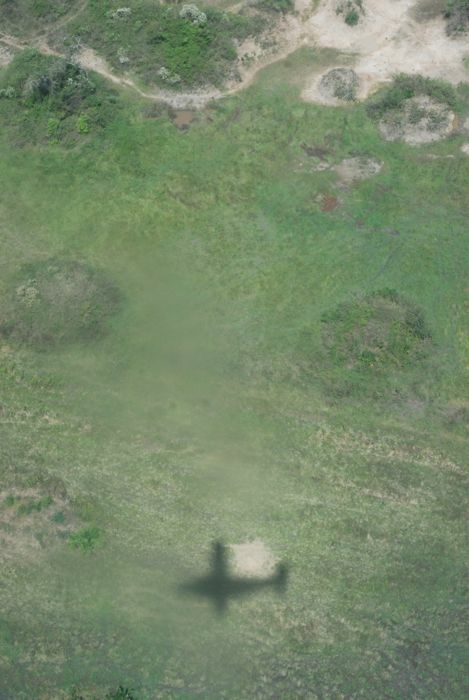 Thank you for your gracious comments, prayers, and understanding when I get a little crazy over tiny airplanes (which we load our big selves into again tomorrow morning – that’s 3 am EST incase you want to set your alarm to wake up and get on your hands and knees and pray for the safety of our souls in real time. I digress.) You are a kind group of readers and I’m so glad you’re following, tweeting, and Facebooking along. Now go pick your child and come back and tell me his name! Or her name, of course. 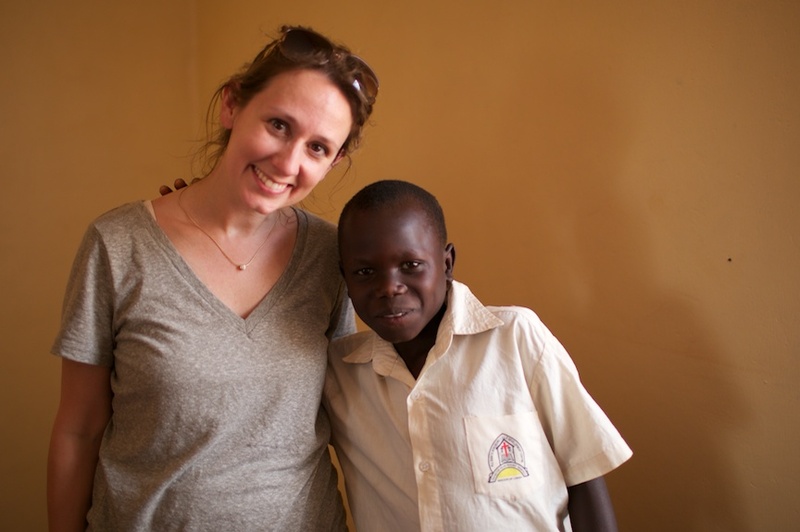 I wasn’t planning to sponsor a child in Uganda. It’s not that I don’t think it’s a good idea, obviously. I already sponsor Pinky in Bangledesh and Stacey in the Philippines. But that was why: we sponsor two children already. Should we add a third child? 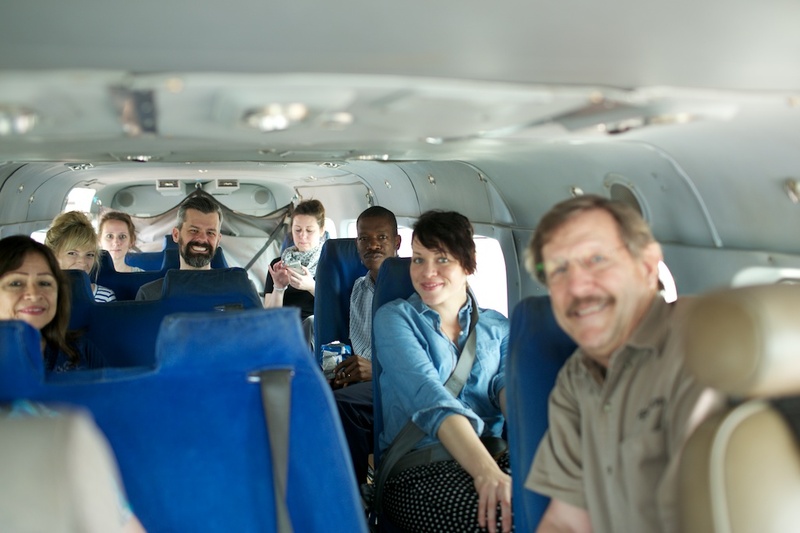 The reason I was even considering it was because I had agreed to travel again with Compassion International to Uganda – this time with Jeff, Joy, and my sister. Whenever bloggers travel with Compassion, we are given the opportunity to sponsor a child from the country we will be visiting. 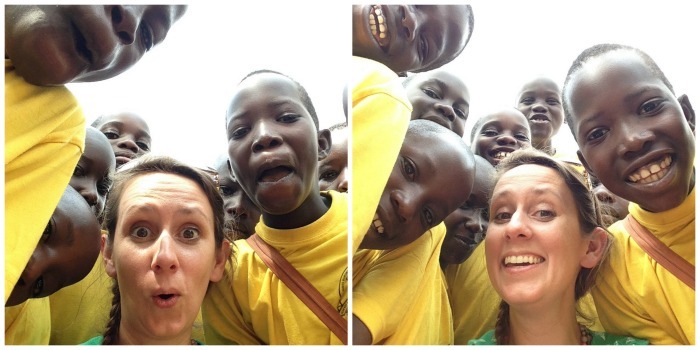 When the email came asking if we wanted to sponsor a child in Uganda, I didn’t pay much attention to it. And by the time I remembered to think about it, the deadline had passed. But then Shaun emailed on Friday a few weeks ago to say we still had a day or so to decide if we wanted to sponsor with the possibility that we would maybe get to meet him or her. He included in the email a link to the page with the children’s photos. I didn’t click the link. I didn’t think of it again until that Sunday night while everyone on Twitter was watching the Golden Globes but we weren’t because our digital antennae doesn’t pick up NBC (we have since ordered a better one because Olympics). He didn’t need to say more than that because we have already had many conversations about how we feel about child sponsorship through Compassion. It wasn’t an issue of trust, it was an issue of timing. Should we sponsor a third child? John just left his job as a pastor in June and our financial situation isn’t as predictable as it has been in the past. And even though I had already agreed to join the team traveling to Uganda, I wasn’t convinced we were to commit to sponsor again. I still didn’t click the link. That night after Downton Abbey was over, we walked through the house turning off lights and locking things up. Before walking upstairs I decided to check Shaun’s email one more time. Y’all. I clicked the link. The children looked back at me on that page and in that moment, unplanned and undecided, I did something completely counter-intuitive. I forced myself to focus on the one I was least naturally drawn to. It was a ten year old boy named Otwii Paul. His face seemed harsh, his gaze unreadable, his jaw set against the world. I hope it’s okay I’m about to say this, but it’s the truth about my first impression of him. At first glance he looked a little bit like a bully. I closed the laptop, uncertain. I went to bed that night thinking of Downton Abbey, of the kids schedule the next day, of my jaw that won’t stop clicking and should I go see someone about that again? Just before the sleep came, right on the edge of the darkness, an hour before the deadline to sponsor was up, I was awake. And not just “in-and-out-of-sleep” awake. I was wide awake, like it was morning. Except it was not. There was Otwii Paul again in my mind – his furrowed brows and unreadable face. I couldn’t shake him. I pulled out the laptop again, ready to click the link for the boy called Otwii Paul. As I waited for the site to load, I thought of how we have two girls and a boy at home. 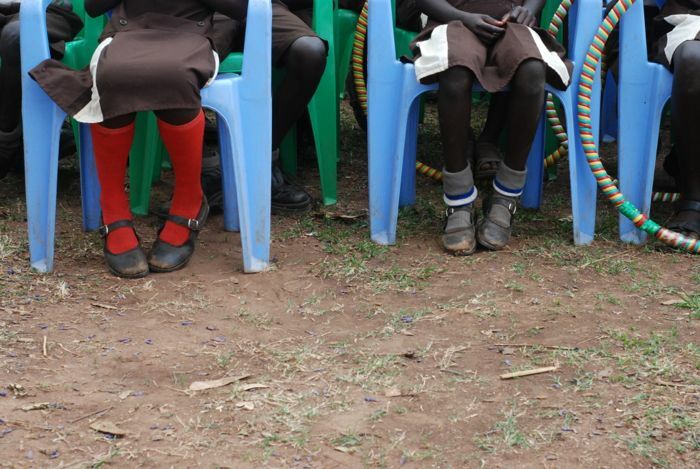 Why not add a boy to our two sponsored girls around the world? I clicked on his photo and signed up to become his sponsor. Immediately I wondered what took me so long? Why all the back and forth? I slept easy that night. That was two weeks ago. On Saturday, I left my home in North Carolina, took a plane, another plane, another plane, another plane, a bus, another “plane” (The-Tiniest-Plane-I’ve-Ever-Ridden-On-Which-Is-Why-It’s-In-Quotes kind of plane) and another bus. 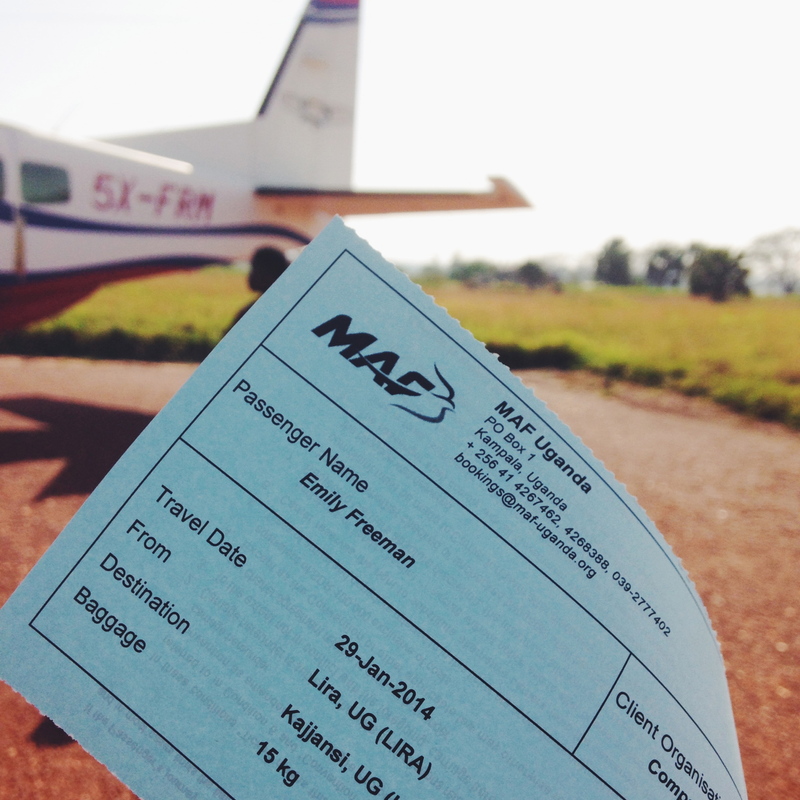 And this morning, we arrived in a little village just outside of Lira in war-torn northern Uganda. 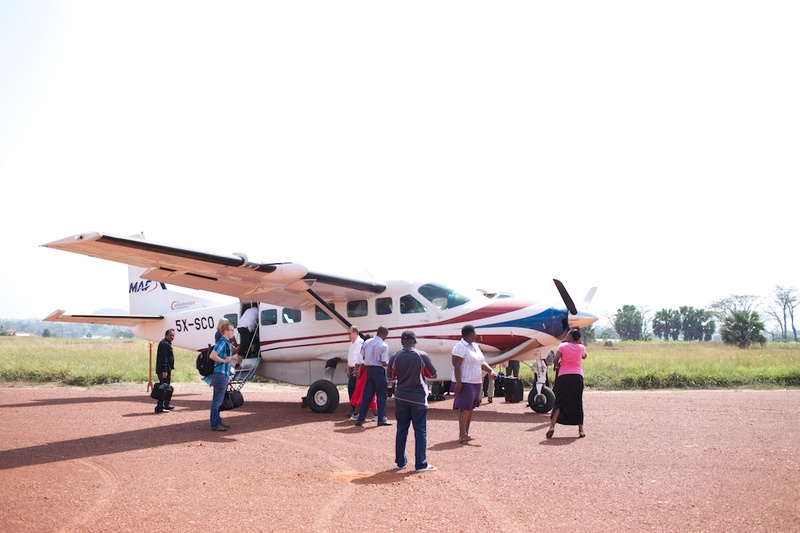 As soon as we landed on the red dirt landing strip, when got off the “plane” and the engines went off and all was quiet, when Grace, our Ugandan companion, came to greet us all – I felt something like an exhale. Not from me, (although I understand why you would think that seeing as how we, fully grown humans, had just landed safely in a Barbie plane). No, it felt like the land around me was in the middle of a long exhale, like we landed right on top of her moving chest, like she has been holding her breath for too many years of war and fear and only recently has she begun to breathe again. I felt her exhale in my soul, ever so slight. An hour later, we’re sitting in a little church, home of the Compassion center in Lira. We’re listening to the kind, soft-spoken voice of the director telling us about the work they’re doing there, about the kind of care child sponsorship provides for the spiritual, economic, social and physical well-being of the children in this center. While she speaks, a small group of children walk into the room, sitting down quietly behind us. I turn around and guess who sits directly behind me? Soon he’s called to the front of the room where I go to greet him with a half-bow and a two-handed handshake because that seems like the most awkward and American thing I could possibly do in the moment. Guess what Otwii Paul is not? The others meet their sponsored children too, pulling white chairs into small huddles, looking at photos of families from home. I learned that Otwii Paul had a sponsor before me but they had to stop their support for some reason. I ask him if I write him letters, will he write back. He nods that yes, he will. We only have a few minutes together with the promise of more time tomorrow. For now, it’s time to head outside to meet all the other children registered in the program. They have us sit in the very front of all the children, the best seats in the house. Or the field, if you want to get technical. We all introduce ourselves and when it’s my turn, Wess points out the fact that I am Otwii Paul’s new sponsor. He goes on to tell the children we have come on behalf of all of their sponsors, to let them know their sponsors are praying for them, to tell them how beautiful they are, to tell them we have hope for their future. What? The boy with the scowly face and the unreadable expression? The boy who I thought, based on his photo, I was least likely to connect with? This boy was the spiritual leader of this group of over 200 kids? I wanted to know what she meant by that, how she knows that, what he does to make her say that. About five minutes later, I find out. Before we leave, Wess calls out to the children, Could you sing something for us before we go? And in those few moments, listening to those children sing through the leadership of Otwii Paul, I thought of my husband back home who left his job as a youth pastor but in a way, because of the ministry of Compassion and the opportunity for us to sponsor, we are able to support a youth who pastors. They told me if I give him my prayer requests, he’ll pray for me. They told me he mobilizes the children for activities. I couldn’t have known any of this about him from his picture. And I didn’t necessarily get any of this from our first shy conversation. It wasn’t until I saw him in his element that I knew what she meant. 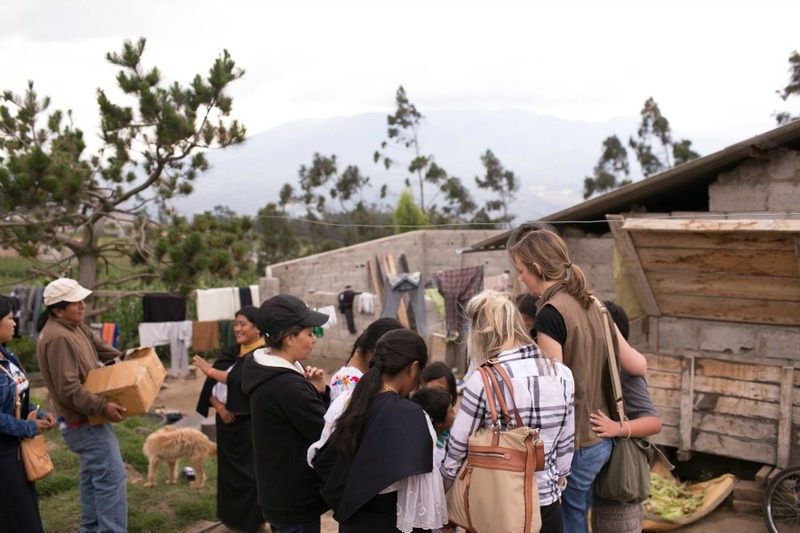 Are you ready to choose from one of these future nurses, mothers, doctors, government workers, farmers, and right-now-spiritual leaders to sponsor? 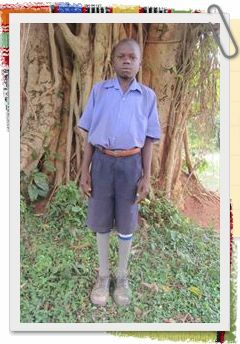 You can visit this page right now to see photos of children still waiting for sponsors. I wonder which child’s photo you’ll least connect with? I wonder what dreams the Lord has for his future? I wonder how your sponsorship might help those dreams come true? Will you sponsor a child today? May your weekend be filled with grace, the kind you receive and the kind you give. May your thoughts be clear while you drink your coffee, your laughs be long while you eat your cake, and may your friendships ever deepen around your weekend dinner table. In some way however small, find time to break bread, thank God, and celebrate. 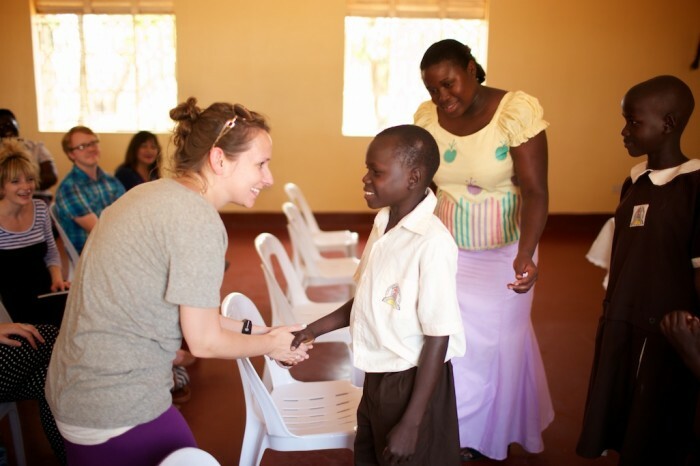 Sponsor a Child in Uganda at Compassion. 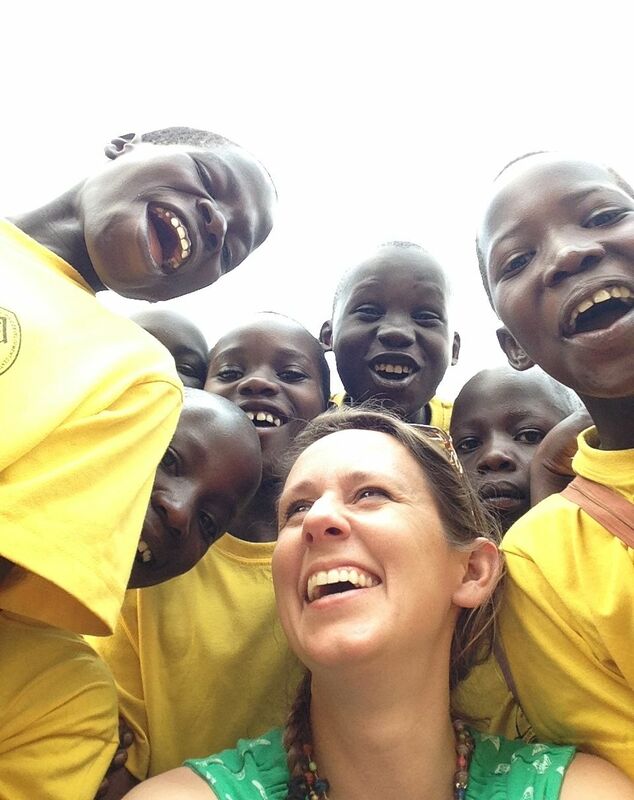 We hope to find sponsors for 500 children who don’t currently have sponsors in Uganda. 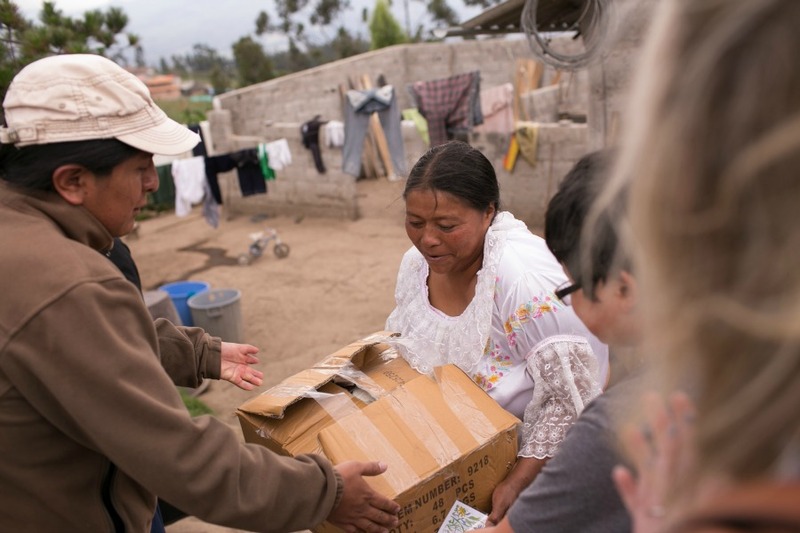 doing on behalf of the children and families in that country through Compassion. 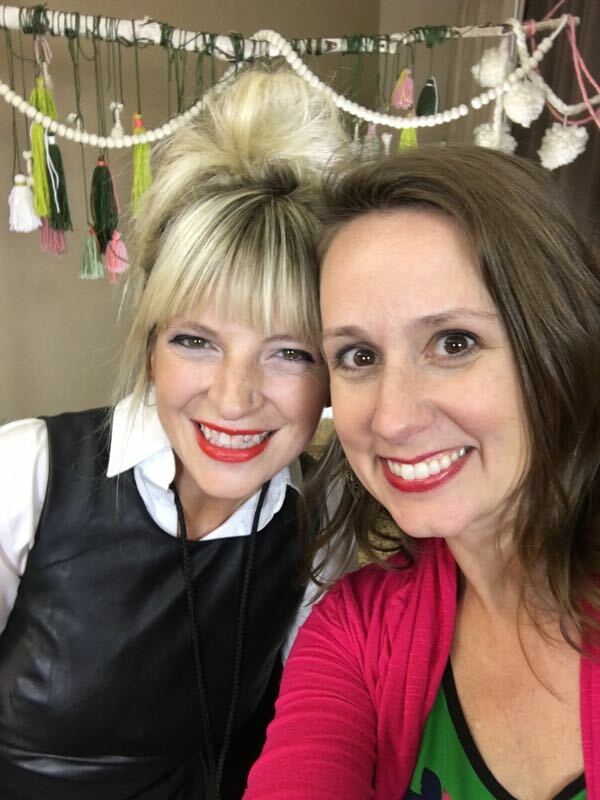 What an honor it is today to host my dear friend Bri’s words here on the blog. She was on both trips I took with Compassion and I don’t know what I would have done without her. Her super-power is unequivocally and without question this: joy. It’s infectious. You’ll see. There are a great many things I adore about Emily. Her wisdom is one of them. A few months ago she shared about how there is always room at the table and I haven’t forgotten about it since. In fact, those words have bubbled up as I have been in Ecuador. Today Shannan, Calvin (her son) and I trekked up a steep dirt path to get to you, Ana. We entered your home and stooped low to sit on your mamma’s dirt floor, to help your family pick corn off the cob. Your mom sat across from us and shared all the hard of her life. How she lost a baby when he was just a newborn. How it’s hard for your dad to find work. 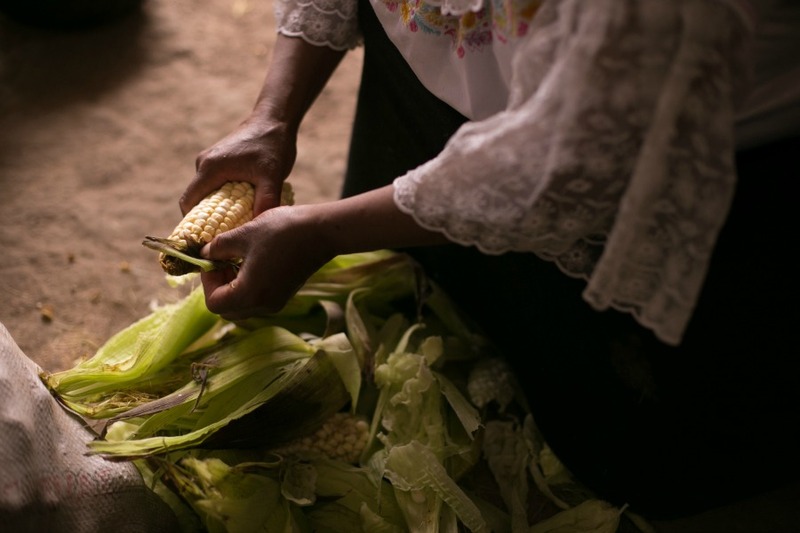 How the food she has for your family (all 11 of you children) is almost always a corn soup that is sometimes infused with some vegetable she went and forged for high on the mountain. If hope is a dripping faucet, your mom’s is as dried up as I’ve ever seen. And my heart ached for her. We asked what hopes she had for you all, all eleven of you, and she responded so quickly – like she’s been turning this question around and around since she bore her first babe at age 24. And Ana you and your two other sisters who are in the Compassion program were standing right there when she said that. I couldn’t help but notice you didn’t seem to mind. So I quickly turned to all three of you and asked what your dreams were. I held my breath as we waited for the answers, wondering if your mom’s despair had taken a toll on your hopes. But Ashley said a doctor, you a teacher, and Maria a fashion designer. 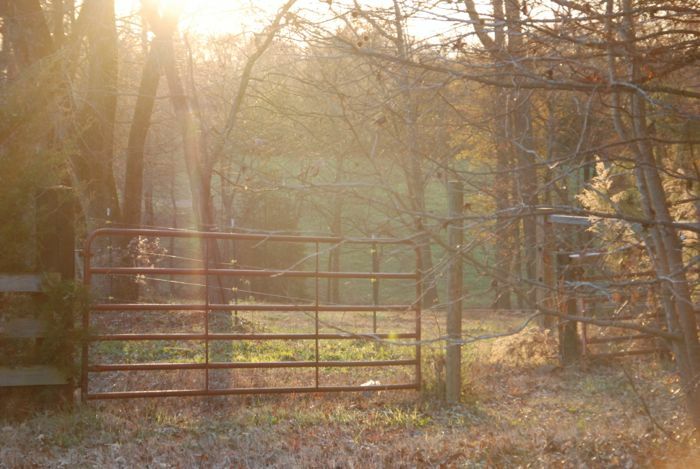 You brought me to the feet of the Holy right there in that tiny mudroom. If Jesus isn’t the answer in the midst of this darkness, I don’t know what is. Ana, if anyone is grabbing at and pulling down the extravagant, sovereign, unimaginable plans of the Lord, it’s you. All too clearly I realized you know there’s a place at the table for you. And you know Who is setting the table. This is the curious thing, you hope big even though there is no shortage of hard for you. Most would say your life is not suited for these dreams. Or really, any dream. And I’ll keep it short because you know it so well, but your community swells with childhood suicide, money and drug laundering, human trafficking and more. The reality of your circumstances are everywhere you turn. But still, Ana, you have this bright idea for your future. You have stepped boldly to the table. You know Jesus is your portion. If there is anyone who is clinging onto Psalm 23 it’s you. The difference between your fierce hope and your mamma’s came eerily into focus as we prepared to leave your home. We gathered on a little dirt patch and prepared to give your mamma a gift. Compassion always provides a family gift after we visit a home because it is important to be gracious guests when someone has invited you to their table. I could hardly stand to wait for your mom to receive this gift. As the box left the hands of our project facilitator and landed into your mom’s arms, her body immediately crumbled to the ground. The weight of it was literally too much too hold. We all gasped completely shocked at what had just occurred. We knew the box was heavy but we also knew that is was manageable to at least carry inside the home. I could not quite reconcile how your mamma was unable to comprehend the weight of the box seeing as it was a medium sized box – nothing small. How had she miscalculated its weight? The box was so full that the cardboard flaps could not even be closed all the way and the tape was struggling to keep the contents contained. That one sentence put into perspective the lens through which she sees the world. And of course she thought it was light, her life has been one where there has been more taken than given. That if she is even aware there is a table she can come to, no one has invited her to it. If any gift has been given to her it was not extravagant. Not weighty. But Ana, I walked away from you and your sisters not completely crushed because you are sure of your Lord and His great ability. There is no limit of hope in me that God is going to use you to do great things for Him. That He will even use you and your love for Him to be a source of great healing for your mamma. That He will use you to invite her to the table. This is the great love of God, that not only is He preparing a table for us, we get to help Him invite His people to the table. In my own life, especially after my visit today, I cannot think of a better way to invite children living in extreme poverty to God’s table than through sponsorship. Please partner with me to pray for Ana and her sisters and her mamma. It is my joy & hope that today you will allow God to bring an Ana into your life. 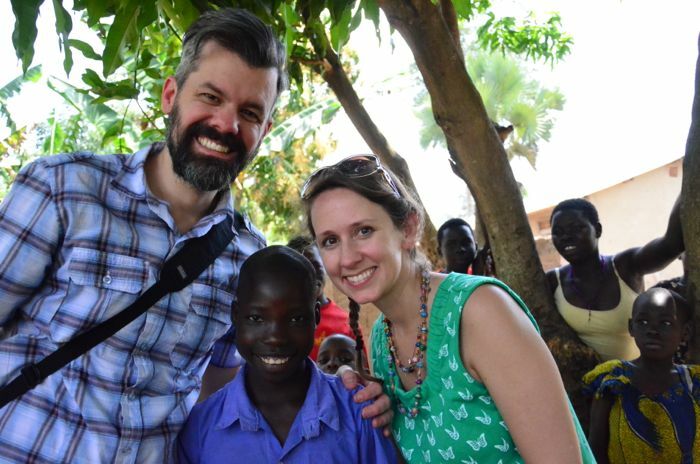 If you were like me, and wondering if sponsorship is the right time or step for you, can I say that I waited too long to sponsor my first child? And a child’s life is not worthy of my “lofty” time-delayed contemplation. We must act. Thank you, Bri. I adore this story. And y’all will want to read Shannan’s perspective of their visit with Ana as well because her view was quite different and I can’t stop thinking about her post. I cannot stress this enough – I have every hope for Ana and children like her because I’ve seen with my two brown eyes how Jesus makes a difference through the work of Compassion. We sponsor 3 children and have not regretted it for one second. 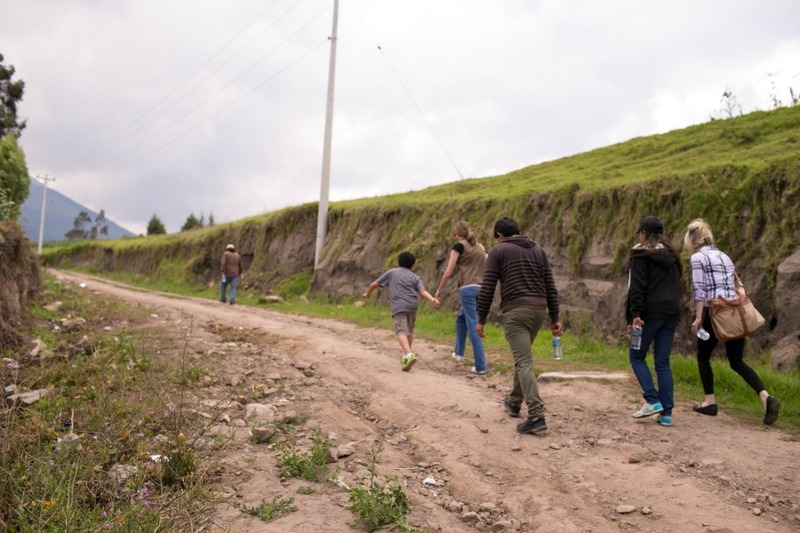 View children from Ecuador who are in great need of hope and love. Sponsor a child today. And! 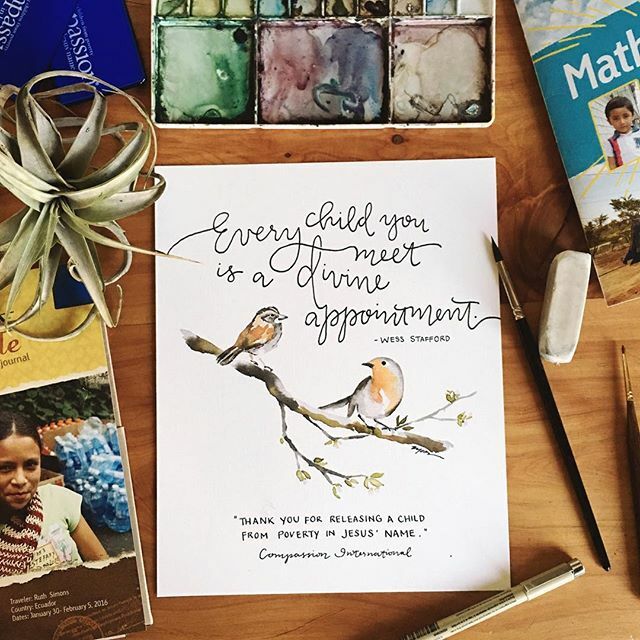 Ruth graciously created a print exclusive to Compassion. To anyone who sponsors a child during the trip, you will receive this print FREE to commemorate your decision to save a life. We kind of have a thing for Tuesdays around here. It comes directly from a song by Sarah Masen called Tuesday. I was running and running without a chance to stop and chat at the sky. And then finally, I stopped for a breath in the evening. In 2009, I started a series called Tuesdays Unwrapped, a weekly practice of celebrating the lovely, the messy, and the unexpected parts of our regular lives. Every week, I would share a moment and readers would link up with their own moments as well. But now we have instagram so that practice of celebrating Tuesday has evolved into sharing photos and moments of our regular lives using #itssimplytuesday – documenting the small moments so we’re sure not to miss them. We celebrate the regular every week and would love to have you join us. Simply take a photo of your simple Tuesday moments and tag them with #itssimplytuesday on, you guessed it, Tuesday. We have nearly 30,000 images in this collection so far! 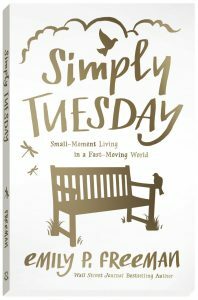 And I’m so excited that now, after years of celebrating Tuesdays together, I finally wrote a whole book about Tuesday – Simply Tuesday: Small-Moment Living in a Fast-Moving World . When I traveled to The Philippines and to Uganda with Compassion International and a small team of bloggers, this blog community was a lovely support. While we wrote about our experience in order to raise awareness for the need to support children and families living in poverty around the world, the readers of Chatting at at the Sky read along, shared those posts, and hundreds of children were sponsored as a result. My family and I continue to sponsor children through Compassion as do many of my readers. Here’s where you can too. Each month I send out a newsletter to subscribers, like a personal note from my bench. This monthly newsletter has become a beloved gift to readers. It’s a gift to me too because you can reply to me via the newsletter and your response lands directly in my inbox. I consistently hear how much readers enjoy these monthly conversations. To sign up to receive these letters each month, enter your name and email right here and you’ll automatically receive my ebook, Seven Little Ways to Live Art in your inbox. Try it out and you can unsubscribe at anytime.